The #DomenicalMuseo initiative continues this year, offering free entrance for all who visit State museums on the first Sunday of the month. 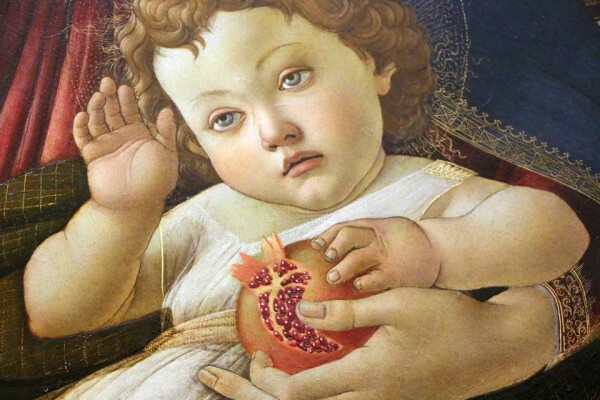 The Uffizi Gallery welcomes thousands on these days, so be prepared for a bit of a crush. You cannot book tickets for this date ahead of time. 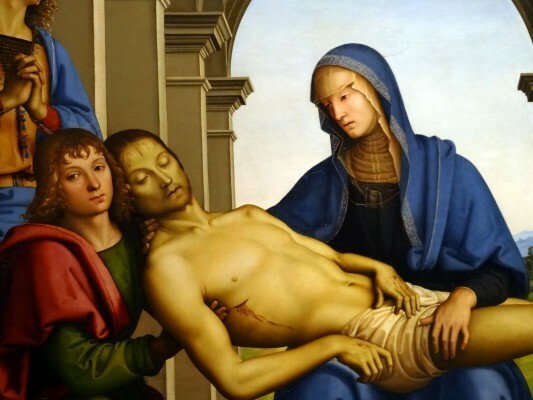 Once again, this year’s edition of the “Mai Visti“, or “Never Seen Before”, showcases works from the Uffizi Gallery normally found within its huge deposits and not seen by the general public. 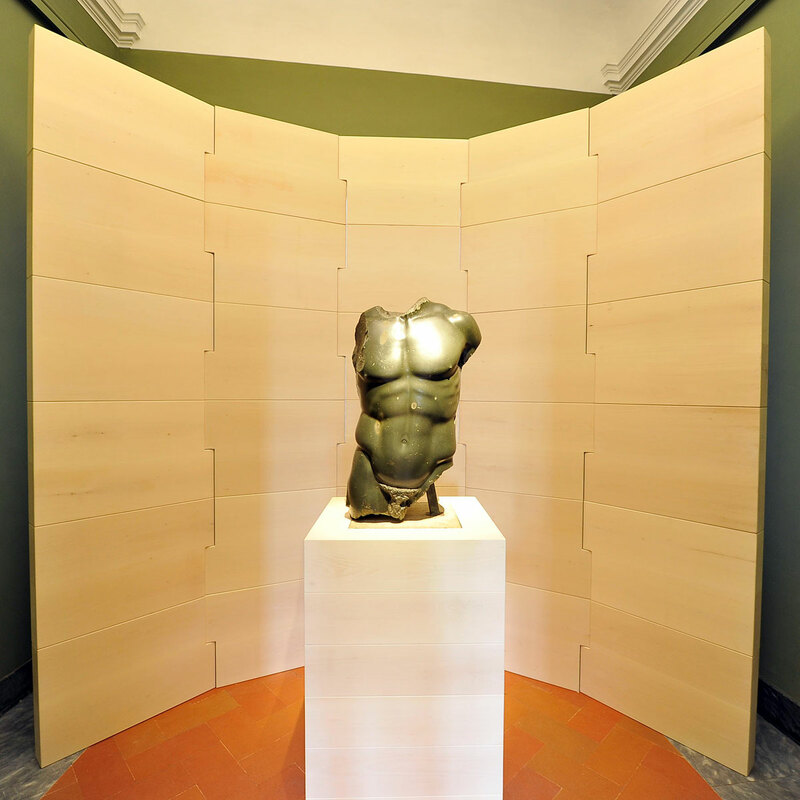 From December 19th until January 31st, 2016, the temporary exhibit curated by Wolfger Bulst with the collaboration of Francesca de Luca, Fabrizio Paolucci and Daniela Parenti, contains 51 works of art that revolve around the theme of Hercules found within the Reali Poste on the right side of the Uffizi (with Piazza della Signoria at your back). The subject, often present in ancient statues (there are 9 pieces from the Uffizi deposits and from Villa Corsini) and sculpture in all sizes, is at the center of the exhibit that celebrates his extraordinary strength and incredible gestures. The central part of the show focuses on the Labors of Hercules (the Roman name for the Greek hero Heracles) with incisions, paintings and other works of art that illustrate various themes: Hercules at the crossroads between Vice and Virtue, which was hugely popular on its own between the 1400s and 1600s; the hero as a subject of research by antiquarians; the interesting iconography of the Gallic Hercules, which had chains of gold and amber spew from his mouth; Hercules as the defender of the Muses, who defend the arts from the avarice of merchants which represents their most insidious enemy. To document the more human and fragile side of this great hero of humanity’s imaginary, there is the moment of satire, when Omphale, the queen of Lydia, has Heracles as his slave wear women’s clothes and do women’s work while she wore the skin of the Nemean Lion Heracles won during his first labor and carried his club. While there is no one source that recounts the story of Hercules, his labors are known from works from ancient writers. The character is quite complex, one with incredible strength and heroic attributes while having human aspects, such as his sensibility to love, which in the end is his greatest weakness. With his labors, he liberates the earth from monsters and evil characters, thus humanity recognizes his labors with a personification of virtue. For this reason, it is clear why in Medieval times the hero becomes a symbol for the Republic of Florence. Then, with when the Medici, and Cosimo de’ Medici in particular, come to power, a calculated decision is to embrace the hero as a propaganda symbol of the virtues of the prince himself. The hero can then be found in the decorations within Palazzo della Signoria, in the main civic piazza in front, in the private garden of Castello and even in the gran-dukes seal, on exhibit. Francesco de’ Medici continued to celebrate Hercules – in his private study within Palazzo Vecchio and in the ceiling frescoes in the first corridor of the Uffizi Gallery and within the Tribune – but by the Baroque age, the human side of Hercules lost its symbolic importance and was no longer a central figure in large works of art. 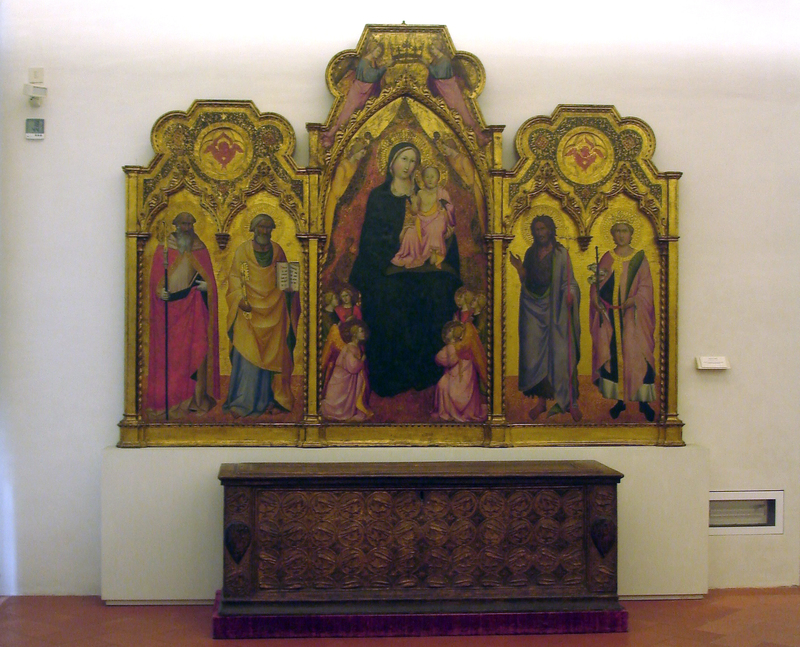 A visit to this temporary exhibit is a must while you are in Florence this winter! Here are the latest news on the holiday hours for the Uffizi Gallery this month (which also covers the museums of Palazzo Pitti and the Boboli Gardens). As is the norm, all museums will remain closed on December 25th and January 1, 2016. The Uffizi Gallery and the Palatine Gallery and Modern Art Gallery at the Palazzo Pitti will be open on December 24th and 31st but will close an hour early – at 5.50om instead of at 6.50pm. Last entrance will be at 5.05pm at all 3 museums. On Saturday, December 19, the Uffizi Gallery will have special longer hours and remain open until 11pm (last entrance at 10.15pm). The Boboli Garden (including the Silver Museum, Porcelain Museum and Costume Gallery) will close at 4:30pm daily as per winter hours. They will all be closed completely on Monday, December 28th and Monday January 4th. All of the museums will be open with normal hours on January 6th, on the Epiphany. 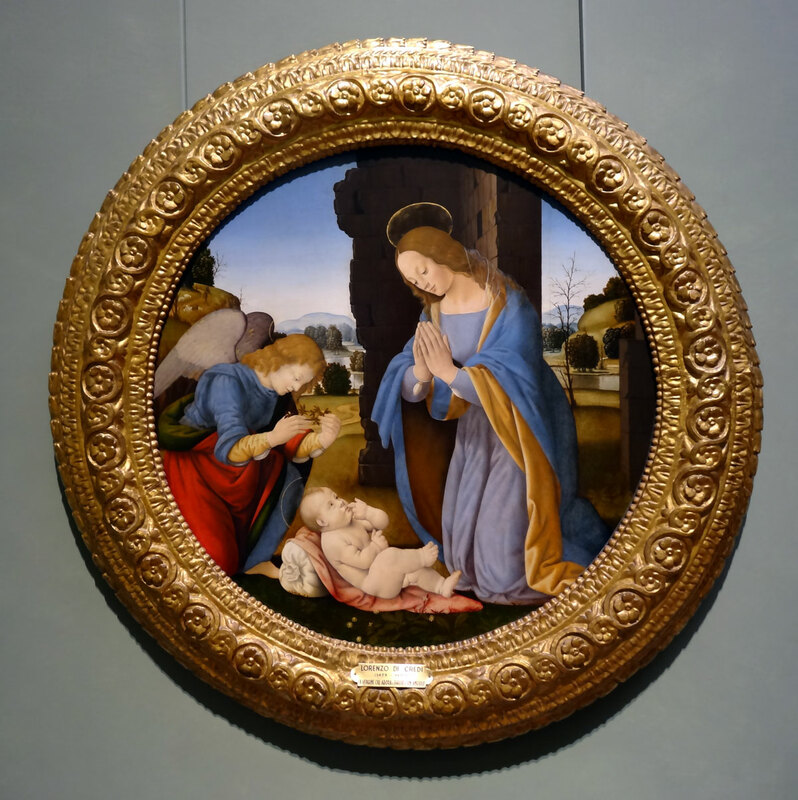 Enjoy your visit to the Uffizi this holiday season! The Uffizi Gallery, usually closed on Mondays, will be open on December 7th to offer visitors to Florence over the long holiday weekend (as the 8th is a national holiday on the day of the Immaculate) a chance to visit. 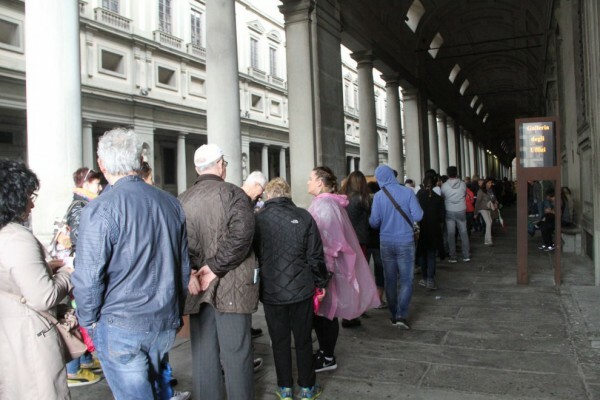 The Uffizi will be open from 8:15am until 6:50pm (last entrance is at 6:05pm). Normal admission cost applies. The day, being a special opening, cannot be booked online – it can only be booked by phone at 055-294-883. Please note that the day before, December 6th, entrance into the Uffizi will be FREE to everyone as part of the “Sunday at the Museum” initiative where the first Sunday of every month is free. If the line is long on Sunday, we suggest going on Monday. Once again, take advantage of free guided visits to the Contini Bonacossi Collection part of the Uffizi Gallery which is normally closed. The free guided visits are available every Wednesday at 9am and 11:30am and in the afternoon at 2pm and 4pm from now until December 16, 2015. Groups will be limited to 15 people, so please make reservations to make sure you have a spot: call +39-055-238-8693 between Tuesday and Saturday from 2:30 to 4:30pm. 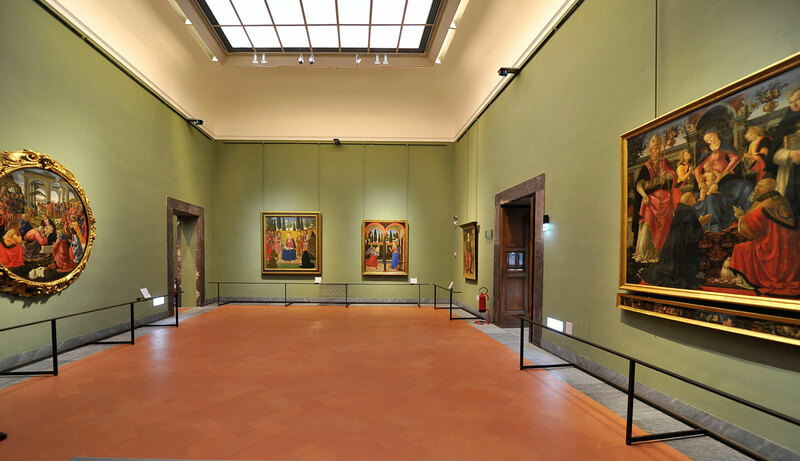 Access to the collection is through the Uffizi Gallery so you do need to pay entrance ticket to the museum – after your visit to the collection, you can return to the Gallery to see the rest of the museum. Meeting point is at Gate 1 (reserved entrance) 20 minutes before your scheduled visit. Starting tomorrow, September 22, works by Leonardo da Vinci, Piero della Francesca and Filippo Lippi will temporarily change home. 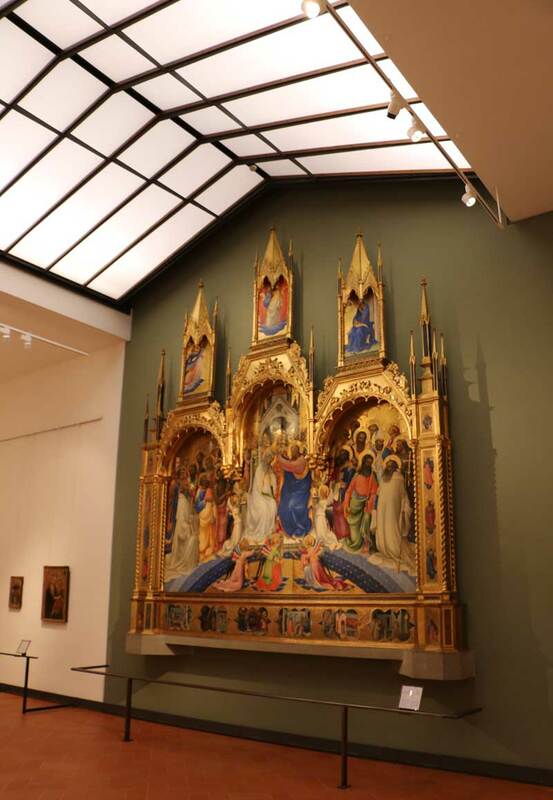 Room 8, with works by Filippo Lippi, will close as the renovation works for the New Uffizi project progress. 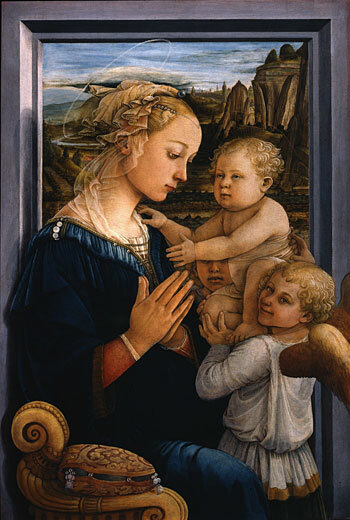 His most famous works, including the Madonna with Child and Angel (seen above), will temporarily be exposed in the recently reopened Hall 28, which is dedicated to his son, Filippino Lippi. The double portrait of the Dukes of Urbino by Piero della Francesca will find its temporary spot in Hall 22, which houses works by artists from Emilia-Romagna from the 15th century. Then from Tuesday, October 6, Hall 15 will also close. The room houses Leonardo da Vinci‘s Annunciation and Baptism of Christ, which during the period of renovation will temporarily be in exposition in Hall 79, on the first floor. Both halls are planned to reopen between Spring-Summer 2016. After years of renovations, halls 25 through 32 will finally reopen tomorrow, Tuesday September 15th. The halls were fully renovated with new air, lighting and security systems as well as restored flooring. 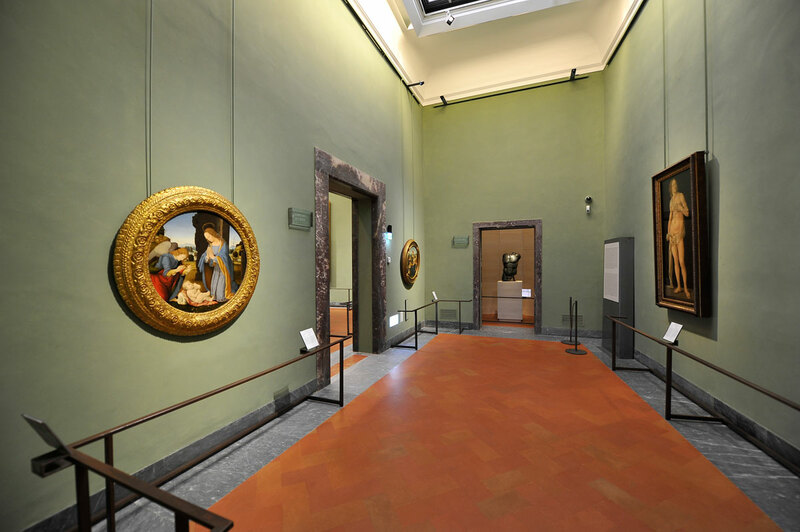 The rooms are now dedicated to Florentine art from the late 15th century, with 43 works of art (including one sculpture) and contain skylights in the center of the ceilings. These rooms held the Medici foundry in the last two decades of the sixteenth century. 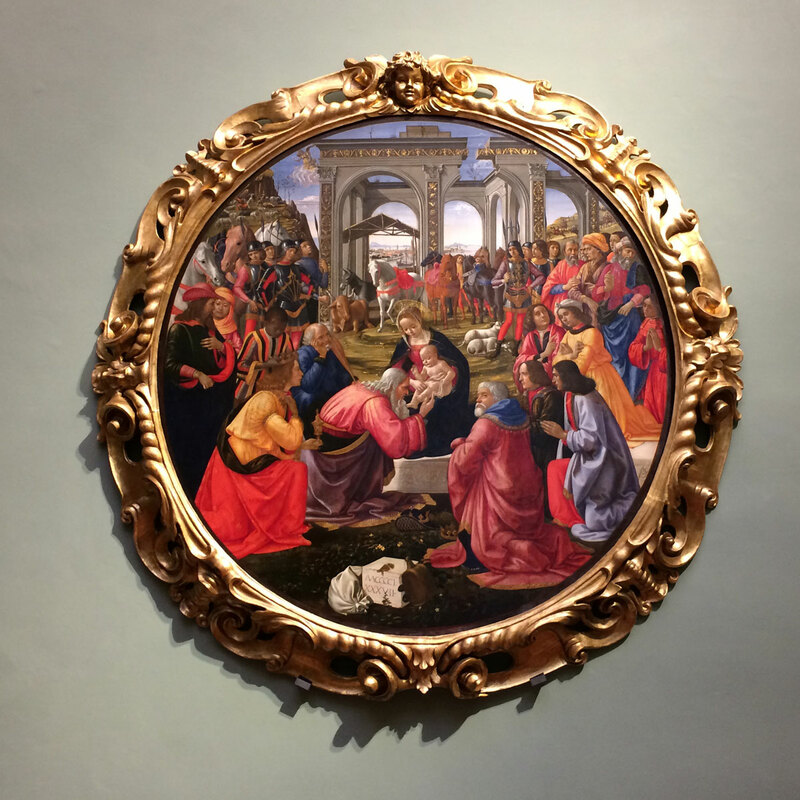 Before the renovations, the rooms hosted works by 16th century Florentine, Venetian, Emilian and Lombard painters, including the magnificent Tondo Doni by Michelangelo (which is now in Hall 35). 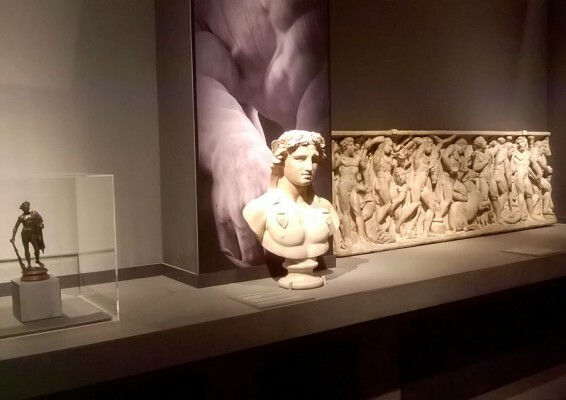 A large part of the renovations were possible thanks to a donation of € 600,000 from Salvatore Ferragamo SpA as the renovations are actually not part of the “New Uffizi” project. These rooms had been been restored after the bombing on Via Georgofili 20 years ago. Then you enter Hall 33 dedicated to Roman art and Hall 34 to the Garden of San Marco (reopened in 2014) before returning to the main corridor. The new rooms continue the green color found in other recently restored rooms with artwork from the 15th century, starting in Hall 6 (behind the Incoronation of Lorenzo Monaco) and in hall 7 (behind the Adoration of the Magi by Gentile da Fabriano) and continued in the Mantegna and Bellini hall (hall 20). As paintings that were once housed in these rooms have made their way into other halls, the chance presented itself to take 25 works of art from the Uffizi deposits and make them part of the permanent collection, reorganizing the halls to also better present and value works of art that are often overshadowed by others in the great halls of the Uffizi Gallery. Such is the case for Ghirlandaio’s “Adoration of the Magi” that now takes over the entire wall where Michelangelo’s Tondo Doni used to be and Halls 26 and 29 whose works all come from the deposits from great artists of the late 15th century that have up to now not been highlighted at the museum, often just for lack of space. Finally – enjoy the view over the rooftop of the Uffizi with view of the Duomo and Palazzo Vecchio from Hall 31! 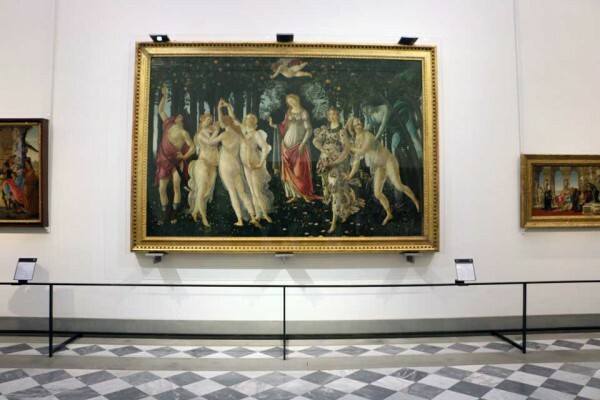 Starting tomorrow, July 14th, visitors to the Uffizi Gallery will find Hall 9 dedicated to the Pollaiolo brothers, Antonio and Piero, and to Sandro Botticelli, in the Uffizi Gallery will be closed to the public. Botticelli Room (10-14) that is scheduled to reopen in 2016. 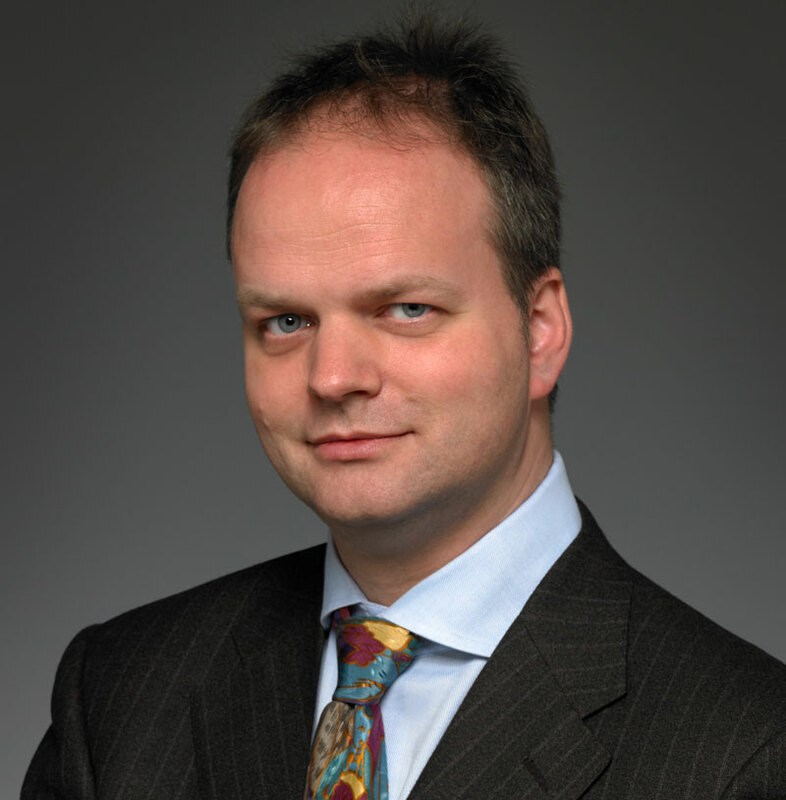 Antonio Natali, director of the Uffizi, said “Botticelli’s masterpieces are the most widely viewed paintings in the entire collection, and so, in order not to deprive visitors of the opportunity to see them, we worked night and day here in the Uffizi to set up another room to host them during the remodeling work. 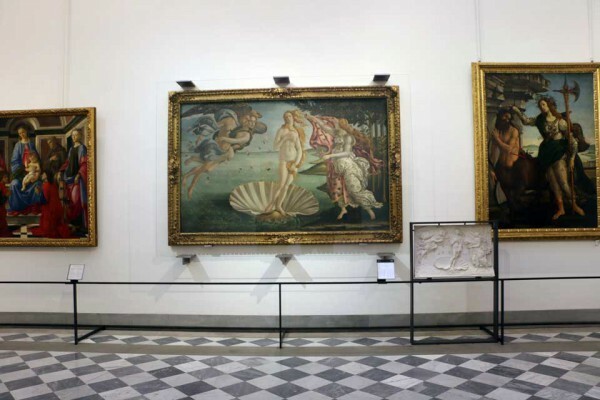 Ultimately, I believe that their new home will offer an even more vibrant view of Botticelli’s paintings”. 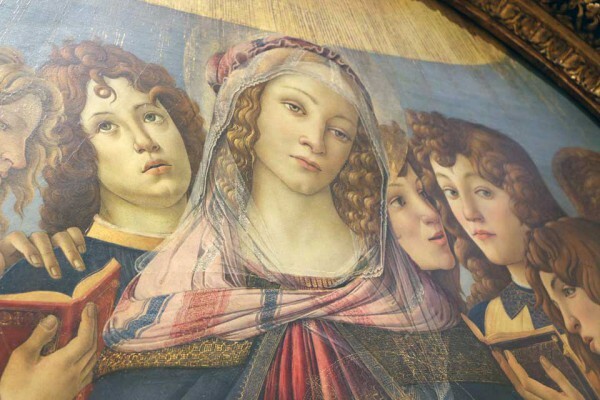 The closing will make it possible to proceed with the “Nuovi Uffizi” – New Uffizi – project which, in addition to indispensable system renovations, will involve a new arrangement of the rooms and a striking display of Botticelli’s paintings. 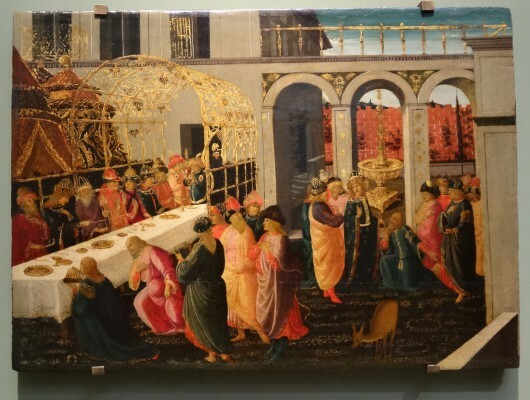 Room 41 will temporarily host a carefully selected group of paintings by Sandro Botticelli. The Madonna of the Magnificat and The Madonna of the Pomegranate will be on the entrance wall; The Adoration of the Magi, The Primavera (Allegory of Spring), and The Calumny of Apelles will be on one of the side walls, and The Madonna and Child with Saints , The Birth of Venus and Pallas and the Centaur will be on the other. On the wall facing the entrance, the Portrait of a Man with a Medal of Cosimo the Elder and Judith and Holofernes will flank the monumental Portinari Triptych by Hugo van der Goes which will be the fulcrum of a section entirely dedicated to fifteenth-century Northern European paintings when the reorganization of the museum is completed. The new rooms highlight aspects of the paintings which could not be fully appreciated up until now with the the new lighting and added space in between. Visitors who have previously visited the museum will be able to view Botticelli’s masterpieces in a new light, literally speaking. Works from the Pollaiolo brothers will be divided – some have gone into Hall 8 while others have been moved to the ground floor, to San Pier Scheraggio, which is usually closed but will be open for guided visits on Thursdays and Saturdays throughout the summer for free. 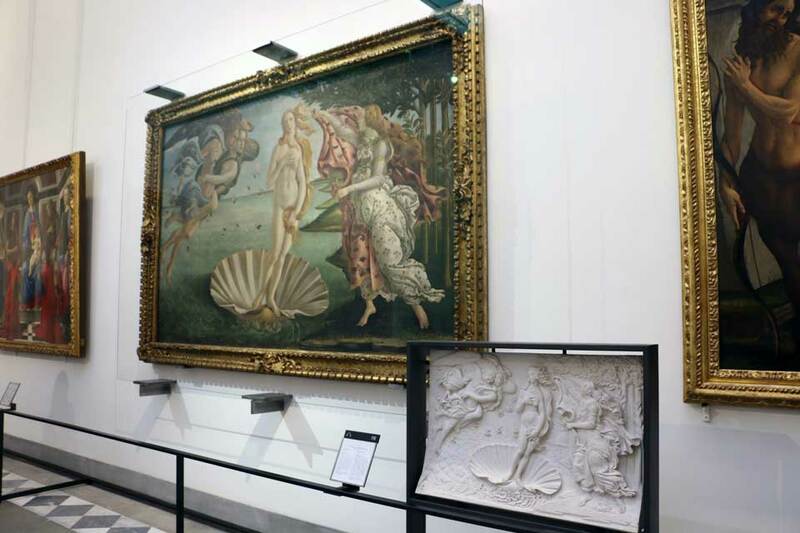 You can view the moving of Botticelli’s main works which occurred last night in the museum to the new hall in the video below and a preview of what Hall 41 looks like! Thanks to the Amici degli Uffizi who funded the project, the entire two top floors that constitute the museum’s main halls now offers visitors access to free Wi-Fi. 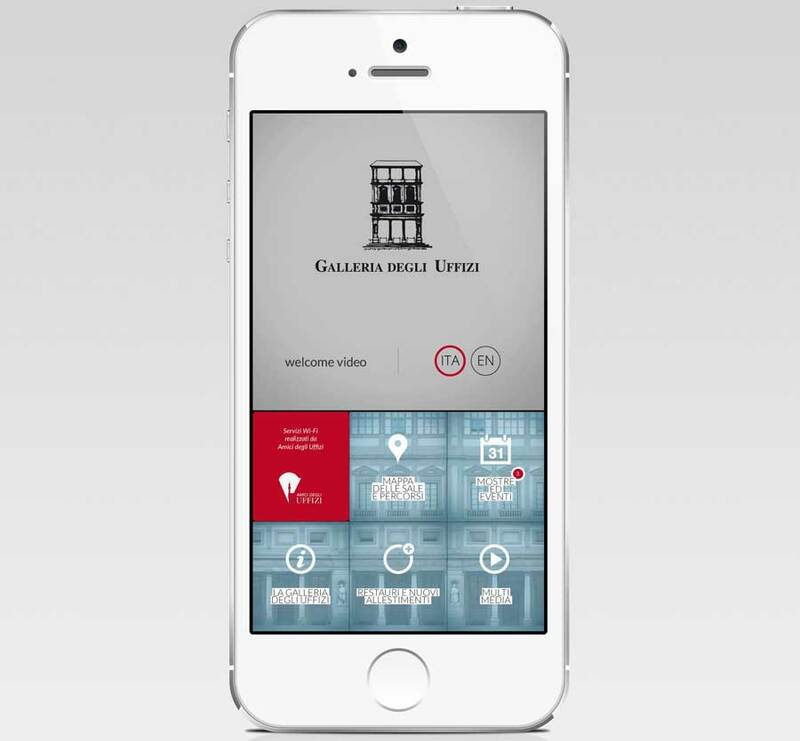 Visitors will be able to check email and visit select websites from their own smart phones or tablets, but the main reason for the new network is to give these users the possibility to access the new webAPP Visitor’s Guide to the Uffizi Gallery while you’re inside the museum. The new network has been active since July 7th, 2015 and allows up to 500 connected users at any time. This transforms the Uffizi Gallery into the first museum in Italy to offer visitors this step to today’s modern world where most everyone travels with a technological gadget to keep updated. The network brings the 430 year old museum into the present, but looks toward the future. By being connected, the museum can plan future exhibits and displays with the use of high-definition video, 3D reconstructions, virtual reality and augmented reality. At the same time, visitors will have access to the new Visitors Guide (as soon as you open a browser you will be directed to this site), where you can find all of the information you need to make the best use of your time and your visit to the museum. News, information on current exhibits within the Uffizi, maps and itineraries as well as detailed information on the works of art in each of the halls you visit. It also has a section that outlines the New Uffizi Project which is modernizing the museum while keeping it open to the world. The guide at the moment is in English and Italian, with more languages to be added soon. For now, this is available to those who enter the museum with their own phones and tablets, but the museum is looking forward to being able to offer the rental of these devices for those who need them. 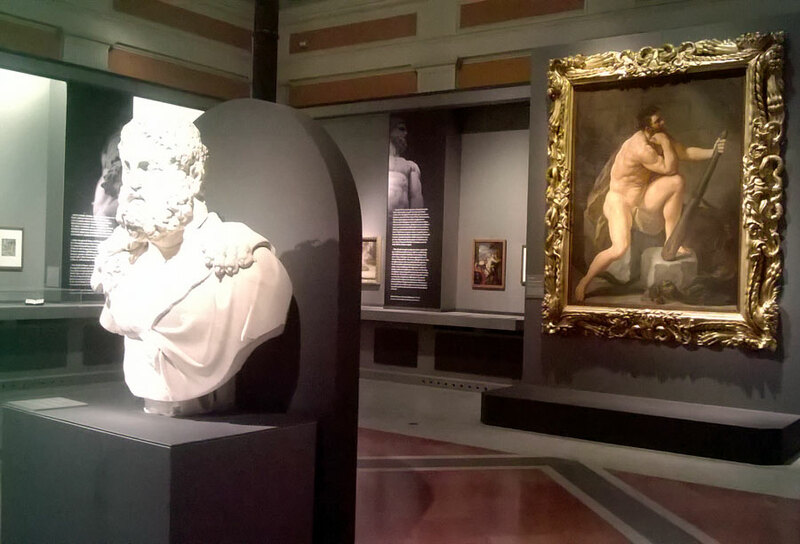 We hope you’ll soon be enjoying your visit to the Uffizi Gallery even more!